Another intriguing dimension to Trump Risk emerged last week, this time involving Salesforce.com and a tart rebuke from one of the groups fighting to stop the Trump Administration from separating migrant families at the border. The story is this: In March, Salesforce signed a contract to provide staffing software and services to the U.S. Customs and Border Protection, a sister agency to Immigration and Customs Enforcement. Then the administration’s family separation policy blew into a maelstrom of public disapproval. Like many companies working with ICE or the Trump Administration generally, Salesforce quickly came under fire from customers and even its own employees for doing business with the administration. CEO Marc Benioff, a frequent critic of President Trump, stressed that Salesforce’s contract with CBP isn’t related to ICE’s breakup and detention of migrant families. To show its anti-Trump bona fides, the company also announced $1 million to various immigrant and migration charities helping with the crisis at the border. RAICES, an immigration services charity in Texas that has become one of the leading groups fighting the family separation policy, was to receive $250,000 of that grant.
.@Salesforce will donate $1M to organizations helping families separated at the U.S. border. I’m proud to work with 30K employees who make their voices heard and serve their communities. @SalesforceOrg will match employee donations to increase our impact. Well, last week RAICES told Salesforce to get lost. Its director, Jonathan Ryan, sent an email to Salesforce that was later published online, saying RAICES could not accept money from a party working with the Trump Administration. When it comes to supporting oppressive, inhumane, and illegal policies, we want to be clear: the only right action is to stop. The software and technical services you provide to CBP form part of the backbone that helps ICE operate efficiently… There is no way around this, and there is no room for hair-splitting when children are being brutally torn away from their parents… We will not be a beneficiary of your effort to buy your way out of ethical responsibility. And back went Salesforce’s $250,000 donation. Working with the Trump Administration isn’t a compliance risk per se. Rather, it’s an ethics and reputation risk that raises the most awkward, unpleasant questions possible for an organization trying to portray itself as in step with mainstream America’s ethical values. That’s because mainstream America (as I noted on this blog several weeks ago) is a largely urban/suburban group with considerable social and economic power — but for the moment, relatively little political power. It leans marginally more Democratic than Republican, and it really can’t stand the ignoramus in the White House parading around like he has any clue about public policy. Increasingly in the Trump Era, yes it does. So when mainstream America can’t vent its frustrations via political means, it vents them through social and economic ones. And when you live in a highly organizable society as we do today (thank you, social media), that venting can blast Corporate America ferociously. That’s the mess confronting Salesforce and many other businesses. That’s the ethical predicament confronting boards of large organizations today. Will it work? As with so much else in America these days, it will probably work well with some stakeholders in your organization, but not with others. Clearly RAICES didn’t go for Salesforce’s approach. 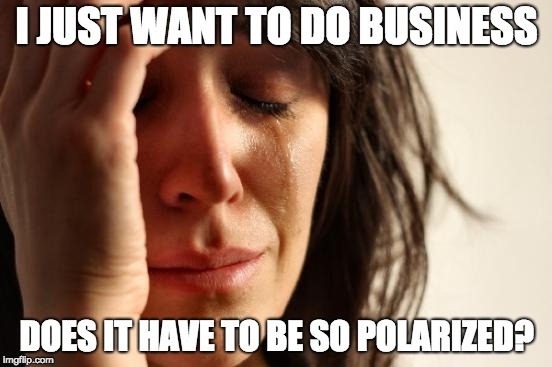 Some customers and employees probably won’t change their minds either. Then again, will that matter? Salesforce has more than 29,000 employees and $10 billion in annual revenue. Consumers don’t interact with Salesforce the way they do with, say, U.S. airlines — which made a point in June of telling ICE not to put its agents and detained children on their flights. A more telling example of Trump Risk came from McKinsey & Co. The consulting firm cut its business ties with ICE earlier this month (a contract worth about $20 million) amid employee dismay at working with the agency. Employees at Deloitte are calling for the same, although Deloitte hasn’t taken any clear action yet. Now, working with ICE is more direct support of the migrant separation policy than working for the CBP. And McKinsey has a radically different business model than Salesforce; its well-paid and well-educated consultants can exert more influence at their organization than the cadres of sales executives can exert at Salesforce. So I’m not surprised McKinsey cut ties with ICE, any more than I’m surprised Salesforce is trying to stick with the CBP. Still, these are two examples that fall on the same spectrum: thoughtful, well-informed stakeholders trying to hold companies accountable for the ethics statements they trot out to the public. The Trump Administration makes it increasingly difficult for companies to do that and keep a straight face. You may want to consider how your organization would handle Trump Risk, or ask the board and CEO how they might want to handle the situation. Because until President Trump himself goes away, Trump Risk isn’t.